Flexible absorption membrane for use in permanent installations. Control system included. The aQflex™ system consists of inflatable absorption membranes for low frequency range, air pump ventilation system and is permanently installed on a TRUMPF 95 track system. The system can be turned on or off at a press of a button. The patented aQflex™ absorber system allows for changing the acoustics of a room to fit any purpose. It can alter the acoustics of a room. It adjusts also the acoustics at low frequencies scientifically proven to be important most notably at amplified music concerts. It is most active in the 63-1000 Hz domain at the fundamental frequencies of musical instruments. For the first time the reverberation time can be adjusted to the multifunctional use between classical, unplugged or electronic music. 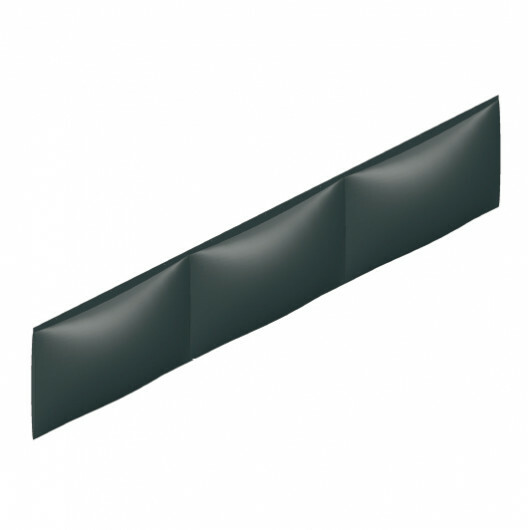 The absorbers can be temporarily mounted (aQtube™) on wires or permanently installed (aQflex™) on Gerriets tracks. The system is CE certified. Meets the flame retardent classification DIN EN 1350-1 in the class B,s1-d0 and the US standard NFPA 701. The system is very lightweighted and therefore suitable to be retrofitted onto existing ceiling constructions. ventilation of the mobile system. The system for permanent installation includes absorbers, tracks, air supply system and control box. Simple, wall mounted ON/OFF switch panel used for operation of system. Air supply requires a 230 V single phase circuit. The consumption of electricity is about 50 to 100 Watt while de-inflating. Low power use of 10 Watt once absorbers are inflated. reverberation times in between extremes. A sensor surveys the system at all times. Any hypothetical malfunction is automatically observed. Can be easily retrofitted in most existing halls without much installation work. Absorbers in off position have almost no impact on reverberation but can be retracted to one side if necessary.